…they keep getting better and better! 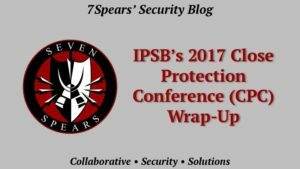 Last year was kind of a watershed moment for the industry; especially those involved in aspects of close protection and executive protection. IPSB held its inaugural conference. We were flabbergasted as this fledgling organization pulled out all the stops to attract the industry’s heavy hitters; security/EP leaders from Facebook, AS Solution, Microsoft, FAM International, GardaWorld, At Risk, Exxon, McDonalds, etc. were in attendance. The VIP list was long and distinguished and included all the “who’s who” for guys/gals like us! There were attendees from countries around the globe. 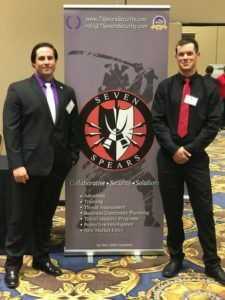 The major educational institutions for our industry were front-and-center and there was a fair representation of the “little guys” like 7Spears and Independent Contractors as well (something that is often woefully missing at these types of events). With memories of such an amazing event last year, we showed up in Las Vegas this year with much higher expectations. And we weren’t disappointed. 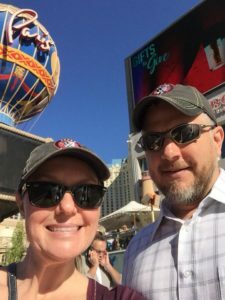 In this week’s blog I’m going to give an overview of the “big picture” takeaways and Jenny is going to go into a little more of the specifics. First and foremost, a tremendous amount of credit needs to be given to the Board of IPSB. It was mentioned that the CPC conference is preceded by a year-long planning event, and their preparation showed. The minimal critiques they had from last year’s conference were obviously addressed and the improvements set the bar high. From topical discussion subjects, to the networking events, to the logistics that it takes to put something like this on…it was phenomenal. I can only imagine the logistical and organizational nightmares, last-minute changes, and technical glitches that HAD to be occurring behind the scenes. But all of that was transparent to the attendees. Good job one and all. The biggest take-away from this conference was, hands down, the networking. Contrary to similar industry events, this one has a much smaller attendance. I, for one, think that is a good thing (IPSB would likely disagree! ha-ha). From a purely selfish perspective, the limited attendee numbers allowed independent operators and small service support companies like 7Spears the opportunity to interact with the major players in our space. This is something that just doesn’t happen at the events of some of our sister organizations. There is a much more “familial” tone to an IPSB conference which allows us all to drop the egos, “open the kimonos” (just a bit!) and connect with each other on a more human, professional-to-professional level. 7Spears walked away from this conference with real connections to real people that we know we can reach out to for assistance or future collaboration. These connections went WAY beyond the typical, “superficial” exchange of business cards that usually happens at events like these. This, by far, was worth the price of admission. Next, I would be remiss if I didn’t address the presentations and panel discussions. At conferences like these (especially in the security industry) there is a tendency to cover very generic topics at a very broad-spectrum level. Hey, we don’t want to offend anyone or give away too much information to a potential competitor, right? Not so at IPSB. Topics were current, relevant, and detailed enough to be immediately applicable. Lessons-learned were shared at the expense of ego’s and a true sense of collaboration and community was fostered in a great learning environment. I cannot think of a single presentation or panel discussion that I wasn’t sitting on the edge of my seat and completely engaged in! If a subject matter or specific presenter offended anyone…well, that person is probably in the wrong business to begin with. The AS Solution crew that always “rolls deep”. We seem to run into each other all over the globe and it’s always great to see you guys. Thank you especially for your leadership in this organization and all that you contribute to this sector of the industry. Christian West – thank you for giving us so much to think about during our lunch conversation on the last day. 7Spears’ extended family at Executive Security International (ESI). As always, it was great to see you guys outside of the schoolhouse environment. Thank you for all the work you did to make this event such a success. We probably need to incorporate an ESI alumni dinner into this conference, as I think about 80% of the attendees were sporting ESI colors! To my fellow ESI cadre in attendance – great to see you. To the newly-graduated ESI peers that showed up in droves – good job! You clean up nicely! I hope you made the most out of this conference and that you continue to attend. Travis Lishok from EP Nexus. We take pride knowing that one day we’ll be able to say “we knew you when…” You are a rising star in this industry and your humility and willingness to share for the betterment of anyone is a thing of beauty. We’re sorry we didn’t get to spend more time with you, but the honorable mention by Joe LaSorsa made you a celebrity and we had a hard time getting through the crowds! Don’t forget us little guys at next year’s conference! Pete Dordal from GardaWorld – Sir, always a pleasure. Thank you for what you and your crew do on behalf of all of us in some pretty unsavory places. 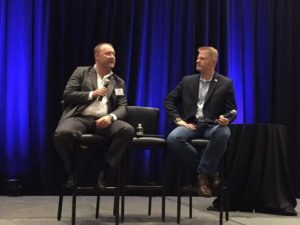 Your panel discussion was electric and filled a much-needed gap from last year’s conference. Gerard Boniello – It was great to finally get to spend some quality time with you and the crew from Omnium “IRL”. We’ve admired you guys from a distance for so long and liked each other’s offerings on social media for years…but it’s nice to know you are just as genuine in person as you are on the internet. Steve and Heidi Albritton from OPStructure: What a pleasure to meet a company who has so much in common with 7Spears! It was great to meet both of you and we truly hope this is just the beginning of a strong collaboration effort between us. We look forward to seeing you down the road very soon. Nate Romero, “Sarge Gish”, and Jason Smith – thanks for rollin’ heavy with 7Spears. 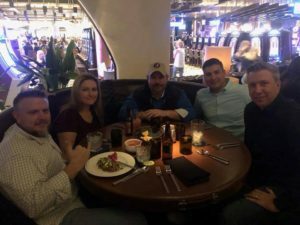 We enjoyed solidifying the Colorado security mafia board of directors! I just wanted to share my thoughts on some of the specific presentations/concepts that came out at this year’s conference. Patrick Van Horne’s Left of Bang presentation: Confidence is a big deal in this industry. Not only do we need to have the confidence from our clients, but we also need to have confidence in ourselves. This does not translate to “cockiness” but rather an inner confidence that our training and skills are on par and that we are able to act when appropriate. In order to have this confidence, we need to constantly be improving our ability to recognize threats AND improve our response to the threats and our use of our equipment. Soft skills aren’t always considered within this industry, and I’m glad that Patrick stressed this during his presentation. Confidence, ability to reduce risk by recognizing threats left of bang and situational awareness are key in this industry. 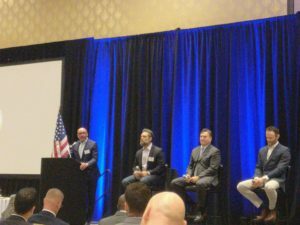 Business of Close Protection panel discussion: My favorite part was Joe LaSorsa’s grasp on COLLABORATION within this industry. I really enjoyed that he stressed that we could all do better with helping our industry with anything they need and in turn be able to receive help when needed. This is such an important concept. The ego is big within the security industry. To be able to set it aside and help each other is something that I relate to and grasp onto when I see it. I will always gravitate to others that are willing to lend a hand to others within this industry. Tac Talk-Operational Planning: Again…one of my favorite briefings within this weekend’s events. I can definitely appreciate that Joe shared the methods that he and his team use when planning and communicating. The Art of the Go Bag: The bag being broken down into 3 sections: “Safe, Happy, Productive” made perfect sense. These three areas should be able to support not only myself and my travel partner(s), but also our customers/clients. Also the fact that a Go Bag is more of a mindset than anything else…what a concept! World of PSD panel discussion: Watching newly graduated ESI students take in all of the info and decipher how to best use it for themselves was eye catching. They seemed particularly interested in Pete’s information regarding how to obtain overseas work. It did not surprise me that after the brief, many of them congregated at the GardaWorld visitor booth! The brief was very informative and certainly gave us something to think about and hope to discuss with the panel members at a later date. It was great to see the board’s use of funds from sponsors and registration covering so many treats for attendees, from evening appetizers and drinks to lunch, coffee, cookies, drinks and snacks throughout the day. It was much appreciated by all in attendance. If there was any room for Improvement, it would be great to see more opportunities for organized networking among small businesses vs the larger businesses. There are some different commonalities and concerns within the small business security population with different trials and triumphs. An opportunity to discuss those topics, or even to hear speakers discuss a topic or two specific to the small business owners would be welcome. All-in-all another great conference. 7Spears wishes each and every one of you a Merry Christmas and we look forward with great anticipation to the collaboration with you that is sure to occur in 2018! P.S. We love collaboration! Please leave a comment, disagreement, or point of discussion in the comments below. If you liked this article, please feel free to share it on social media! If you need more detailed assistance on challenges specific to your family, group, or company, please contact us via the “Contact Us” link or email info@7SpearsSecurity.com. Great review of the conference! This being my first one I didn’t know what to expect but came away with a lot more than expected for sure! Looking forward to next years conference already.